Donald Trump was on Wednesday interrupted by a Methodist church pastor who said she invited him to the church to thank him for his work in Flint not to give a political sermon or berate his rival Hillary Clinton. "This public event is open to all and today Donald Trump came to observe. Trump's presence at Bethel United Methodist in no way represents an endorsement of his candidacy," Rev. 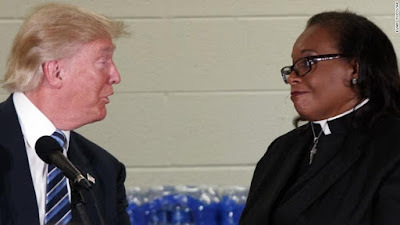 Faith Green Timmons of the Bethel United Methodist Church Flint, Michigan had said before Trump came up to the podium. Mr Trump took to the podium and said Clinton caused Flint economic pain by supporting free trade arguments. "Hillary failed on the economy. Just like she's failed on foreign policy. Everything she touched didn't work out. Nothing. Now Hillary Clinton --," Trump said before he was cut off by the church's pastor. "Mr. Trump, I invited you here to thank us for what we've done in Flint, not give a political speech," she told Trump after walking to the podium while Trump was speaking. "OK. That's good. Then I'm going back onto Flint, OK? Flint's pain is a result of so many different failures," Trump said.